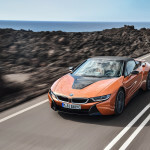 Caraganza First Drive Review 2019 BMW i8 Roadster: Off with their head! Sometimes you just have to go with the flow. Like it or not the world changes and we have to either change with it or be left behind. I will however continue to refuse to wear skinny jeans and will always order my coffee using only one word, “black”. While I can change with the times, I still get nervous when I get behind a Prius. There’re two reasons: 1. I think that that whoever bought a Prius isn’t good at making decisions, and 2. It’s a Prius. And while it did start the hybrid revolution, the Prius is priced the way it is simply because it’s a Prius. Sort of like when the first cool snap of the year hits and all the white girls put on their Ugg’s and head to Starbucks for Pumpkin Spice lattes. It’s the ‘in’ thing, going with the flow, keeping up with the Jones’s. When I see a Prius in front of me, I have to get past it, no matter what. Drive on the shoulder, endanger children getting on the school bus (sorry), whatever it takes. I must be in front of that Prius. Look, I know that someday all cars will be some sort of hybrid, or plug-in, or hydrogen, but until then I will do my best to cling to the V8 ways of the past. Yes, it’s a losing battle, but one I shall fight until the very end. 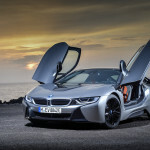 I’ve always been curious about the i8. Since it was introduced to the public in 2014 I admit to a bit of curiosity. Sure, it’s a plug-in, hybrid, but damn it does look good. 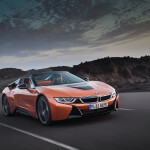 That’s why I was more than a bit excited when BMW sent me a 2019 i8 for a recent week. At first glance I knew my fears were founded. Looking at this long, lean beautiful piece of machinery I realized that I could indeed be brought headlong into the hybrid era very easily. 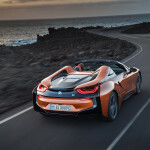 Prior to this year the i8 could only be had as a coupe; for 2019 there have been several changes, specifically they lopped its head off and made a Roadster out of it. This hybrid has a new lithium-ion battery pack with an increased 11.6-kilowatt-hour capacity. This gives a 12-hp bump in peak power from the front electric motor, bringing its output to 141 hp and 184 lb-ft of torque. 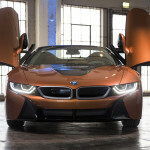 That’s combined with a 1.5-liter turbocharged inline-three that makes 228 hp and 236 lb-ft. 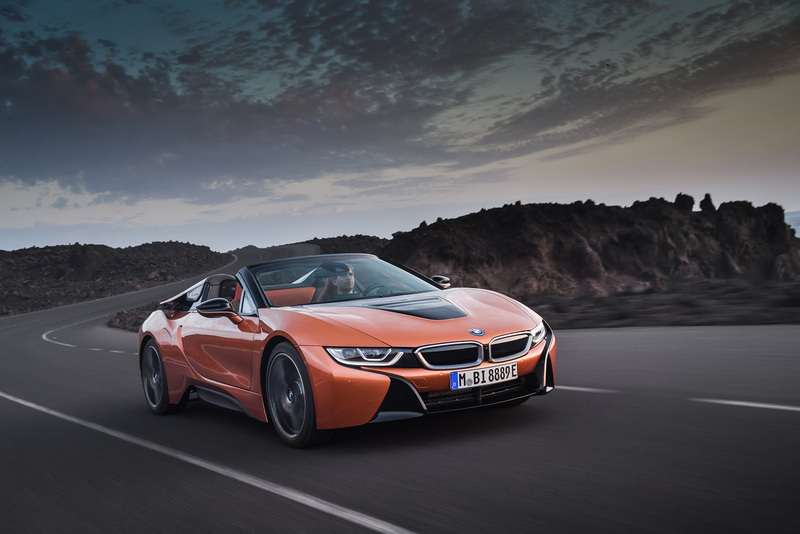 The i8’s battery improvements bring its combined output to 369 hp and 420 lb-ft of torque. Sure, there’s an increase in the electric range for 2019 of 18 miles, up from 15 miles with the old battery. And that’s almost like those silly German’s giving a token nod to the plug-ins. 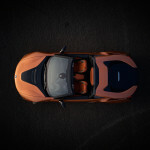 The biggest change though is that soft top of the new Roadster. 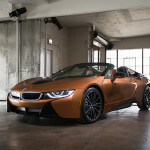 The coupe could seat 4 (not easily, but) this new Roadster seats two, that’s it. There is some storage behind those seats, but you end up with roughly 3.5 cubic feet and a total of 4.7 cubic feet in the compartment where the trunk resides. But I didn’t care, and neither will you. 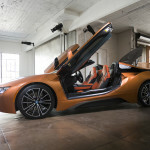 The butterfly doors swing up and unless the top is already folded back, you might struggle a bit to get in. 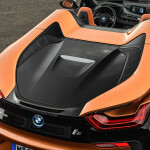 That new cloth top can open in less than 16 seconds and operate at speeds up to 31 mph, by the way. 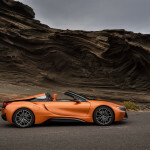 Because on the road the i8 Roadster is pure joy. My week was spent in Central Florida during a time of the year with temperatures in the low to mid-70s and the normally stifling humidity relegated to somewhere in South America, or wherever it goes in November in Florida. This left a streak of days perfect for top-down motoring; unlike the rest of the year when putting the top down is only for tourists in rental cars who leave with second-degree sunburns. The engine is silent when in ‘Comfort’ mode but switching to ‘Sport’ engages an artificially produced growl. And in that mode 0-60 in 4.4 seconds (with an electrical boost) is a thrill with the six-speed automatic performing perfectly. Once in the cockpit there is plenty of room and the Heads-Up Display meshes perfectly with the modern spaceship looking dash surrounded with carbon fiber. 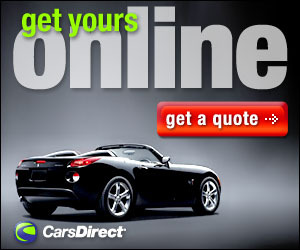 You can go up 65 mph on electric power alone or 75 mph in eDrive mode, but why? I admit to testing the eDrive system for a few miles (it worked fine) but was anxious to get back to that growling Sport mode. 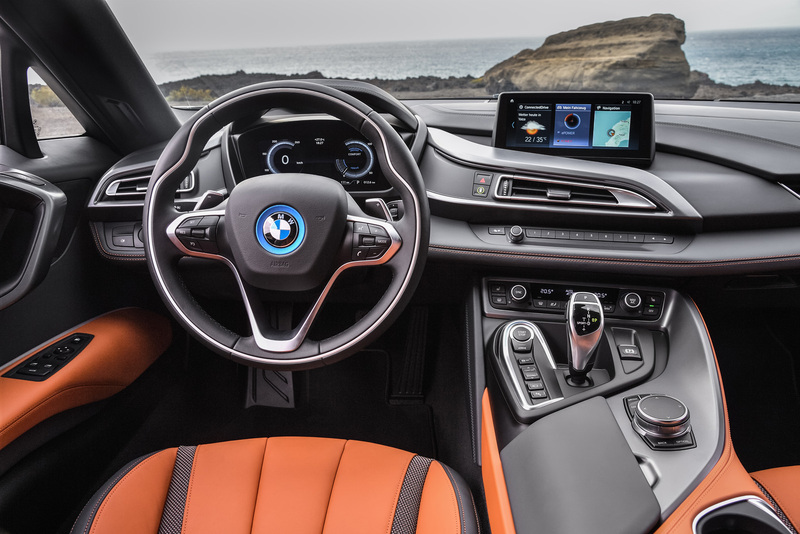 There are several plug-ins that will go farther, hybrids that might have an edge in performance, but none, in my opinion, look nearly as good as this i8. 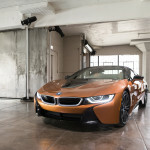 Benoit Jacob, the head of design at BMWi when the i8 was born, hit a home run. 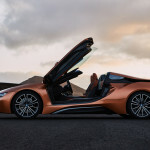 Jacob is now somewhere in China, but he left a legacy of one of the best-looking cars I have ever laid eyes on, and something that is more in reach than many of the supercars the i8 mirrors. 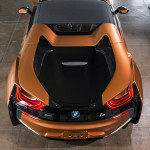 With the loss of the hard top the Roadster has a lower profile atop the optional 20-inch lightweight my tester had. It was also clad in Tera World Copper, a new color for this year (Copper, electric car, get it?). This car screamed “LOOK AT ME” wherever it went. There was more than one conversation with admirers, pictures, questions in the parking lot, and lots a smiling behind the wheel. Let’s face it, at $166,795 MSRP most of us won’t be putting one in our driveway, but I sure bet that for many of us, myself included, we would do so if we could. I guarantee you if this is the future of motoring, I’m all on board. Just don’t expect me to ever follow a Prius.